3/13/12 Know your subject, know the outlet you are trying to pitch and its audience, and have some “news” sense—that was the message from four of Washington’s top editors to over 100 public relations professionals attending PRSA-NCC’s “Meet the Assignment Editors” workshop at the Navy Memorial. 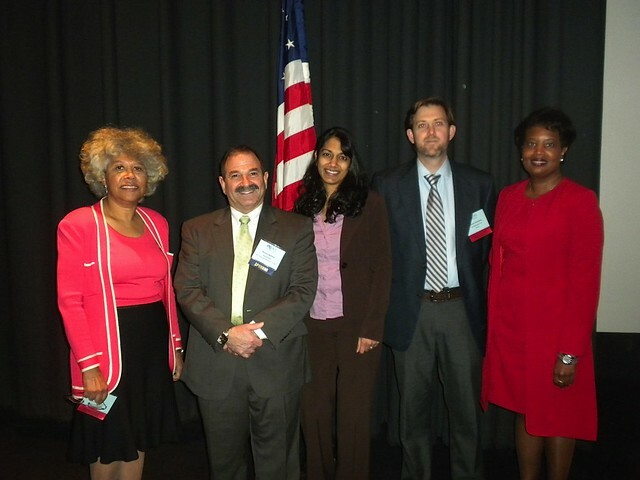 Shown in picture are Lois Dyer, CBS News; moderator Danny Selnick, Business Wire; Vandana Sinha, Washington Business Journal; Steven Ginsberg, Washington Post; and Lisa Matthews, Associated Press. Keep it simple and to the point and avoid jargon. This sage advice from Washington, DC assignment editors should not come as a shock to most seasoned PR pros, but listening to the panel at the National Capital Chapter of the Public Relations Society of America’s (PRSA-NCC) March 13 event, you might be surprised. Voicemail: Ginsberg does not check his voicemail, but Dyer does. Most said they would respond to your email or voicemail if they were interested (and sometimes if they were not), so the follow-up “Did you get my email?” call is often not needed. If you don’t hear from them, a call with a fresh reminder of the subject in a day or two is acceptable. Twitter: Twitter can be an effective way to pitch your story according to Ginsberg. He said all the Post reporters are on Twitter most-of-the-time, and you can learn about their needs from their tweets. You should consider becoming an expert on Twitter for the subject(s) you pitch most often. Multi-Channels: All panelists reminded the audience they have multiple platforms to fill with content. For example, the Washington Post is not just the print paper, but several websites and apps. Matthews says all the AP reporters write and shoot their own stories for various sites and platforms. The PRSA-NCC audience actively shared many tips and highlights of the event. I’ve created a Storify of some of the top tweets and posts. Know your audience (the media outlet’s audience) – Sinha stressed the Washington Business Journal covers only local business news. They do not care about national stories. Respect deadlines – Sinha also hates pitches coming in right before her Wednesday afternoon deadline for the print edition. Early Friday afternoon is an ideal time to pitch her. Know what you are pitching and have answers for questions. Include current contact information on the release. Think about and pitch stories for future happenings or trends. Understand the need and provide visuals which can enhance the story – Both Matthews and Dyer confirmed outside video content is only used in extreme cases, where there is no other place to get the footage. Send pitches to someone else in the newsroom if you are turned-down by the editor. Send multiple separate emails. (However, it is OK to copy relevant reporters on a pitch). Sound like a commercial, you can bet your pitch or press release will be deleted. Want more tips on writing effective messages and pitches? Check out the latest BurrellesLuce Newsletter: Writing Effective Messages – 5 Timeless Tips. And be sure to share your hints for contacting editors with BurrellesLuce Fresh Ideas readers. Last week, on October 27, 2011, I had the opportunity to connect with industry professionals at the PRSA-NY panel, Successfully Integrating Online Video Into Your PR Campaigns. Eric Wright, senior VP of marketing and business development, DS Simon Productions, Inc., offered additional insight on why digital video matters to the media. AOL Newsroom is now bigger than the New York Times. Journalist are using online video on their website. 79 percent will use more online video in their messages. Interestingly enough, over 50 percent of journalists say that video is vital to their jobs and that HD is the most important format.